This post is a guest submission from Christa Stables, a Master’s Student in the Department of Sustainable Biomaterials at Virginia Tech. Her research focuses on the wetting and penetration behavior of various resin/wood interfaces. Have you ever wondered w hy stoplights are red? What makes red so special? Is it because it’s the color of danger? Is it because blood is red? Even though some people think these are the reasons why there is actually a more scientific reason for why stoplights are the color red. The stoplight was first introduced primarily for railroads during the Industrial Revolution, and then into society as the population grew and more accidents occurred. However, it wasn’t until a British physicist, Lord Rayleigh, discovered why the color red worked so well, that we truly understood how practical red really is. Think back to your middle school science class, where you learned about the ROY-G-BIV light spectrum. Red has the longest wavelength in the visible light region, and with a longer wavelength it is least likely to be interfered with. Another way of thinking about interference is light scattering. Light scattering is just what it sounds like, the beams of light are deflected, or scattered, off other particles, or objects in the air. These particles in the air are polarizable, meaning they can align together based on charge. This alignment is what causes the light scattering, also known as Rayleigh scattering. Rayleigh scattering can be seen when you are driving your car with the lights on in foggy area. When you shine a light in fog, it seems as if the fog blocks the light from going very far, in fact the fog seems to spread the light wide instead of being narrow. Thus when you compare your headlights to a red light, your headlights, which have a shorter wavelength, are scattered more than the red light, enabling you to see the red light far enough away so you have time to stop. Since it is more important that you know when to stop than to accelerate, it is conclusive that red designates stopping and green accelerating. 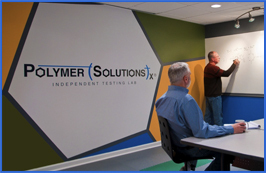 The scattering mentioned earlier can also be applied in our labs here at Polymer Solutions Incorporated. Sometimes we need to determine the molar mass or the size of a polymer we are investigating. One of the methods that can be used to determine this is called Size Exclusion Chromatography or Gel Permeation Chromatography. This method can separate different molecules based on their mass which helps us to determine what the polymer is made of. The polymer is inserted into a column that separates it into groups based on size. Once it goes through the column, a detection system is needed to determine the properties. One type of detection system is light scattering. This method shines a beam(s) of light into the polymer and the light photons are absorbed by the polymer as well as scattered in different directions. The amount and direction that the photons are scattered is related to the concentration, the molecular weight, and the size of the molecule. For example, say you have a polymer that has three different molecules. When you place it in the column, the molecules separate and you get one at a time. Each molecule is then detected to determine the concentration, molecular weight and size; giving us the total molar mass of that polymer. As technology has advanced, light scattering has become more understood, and has been able to be used in methods like Size Exclusion Chromatography. It is important to keep in mind that light travels very fast, so any detection system using light, must be very accurate and precise. Now that we know the real reason for red stoplights, we can say we used more of the ROY-G-BIV light spectrum than just memorizing the colors of the rainbow. Pothecary, Mark. “When Only a MALS Detector Will Do…” The Analytical Scientist. N.p., n.d. Web. 9 Nov. 2016. Nobbmann, Ulf. “Size Exclusion Chromatography – When to Use MALS?” Malvern-Material Talks. N.p., 27 May 2014. Web. 9 Nov. 2016. Hiemenz, Paul C., and Timothy Lodge. Polymer Chemistry. 2nd ed. Boca Raton: CRC, 2007. pp. 289-302, 360-371. “Why Do Traffic Lights Have Red, Yellow and Green Color? Why Don’t They Use Other Colors?” Quora. N.p., 13 Nov. 2014. Web. 7 Nov. 2016. Ament, Phil. 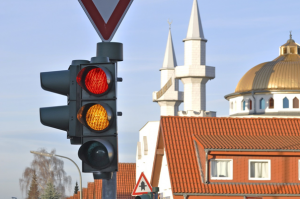 “Traffic Light History – Invention of the Traffic Light.” Traffic Light History – Invention of the Traffic Light. N.p., 2007. Web. 7 Nov. 2016. Osborne, Hannah. “History of Traffic Lights: 100th Anniversary of the First Electric Traffic System.” International Business Times UK. N.p., 04 Aug. 2014. Web. 7 Nov. 2016.